The Horsehead Nebula's dusty shape all but disappears in infrared wavelengths, as seen in this image from NASA's Spitzer Space Telescope. The Horsehead is a small part of the Orion Molecular Cloud Complex. In this picture, the Flame nebula (NGC 2024) dominates the center and another nebula called NGC 2023 lies in between the Flame and the Horsehead. One of the most well-known nebulas of the night sky — the Horsehead nebula — all but disappears in a new infrared NASA image. In the new photo, captured by NASA's Spitzer Space Telescope, the shadowy Horsehead nebula loses its distinctive shape because of the infrared light wavelength used to make the image penetrates cosmic dust. The main view in the new Spitzer image is the Orion Molecular Cloud Complex, the larger home of the Horsehead nebula. At the center of the image is the Flame nebula (NGC 2024) and to the right, just beside the Horsehead, is a smaller nebula called NGC 2023. Collectively, all of these areas are about 1,200 light-years from Earth. "The two carved-out cavities of the Flame nebula and NGC 2023 were created by the destructive glare of recently formed massive stars within their confines," NASA officials wrote in a statement. "They can be seen tracing a spine of glowing dust that runs through the image." Hotter wavelengths in the image are represented by blue and cyan (blue-green) light, which show wavelengths of 3.6 microns and 4.5 microns respectively. 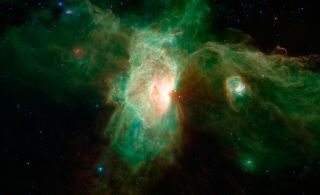 At the other end of the scale, cooler green and red colors show the nebulae's dust. Part of the image includes data from NASA's Wide-field Infrared Survey Explorer (WISE), which observed in infrared wavelengths over the entire sky. The Horsehead's official name is Barnard 33, or B33. It was first discovered in photographic plates in 1888 at the Harvard College Observatory. The discoverer was Williamina Fleming, a maid of astronomy professor Edward Pickering. Pickering hired Fleming and several other women, who were known as "computers," to catalog images taken at the observatory. Fleming had a productive career, discovering 58 other nebulae, 10 novae and more than 300 variable stars. The official name of the nebula comes from Edward Barnard, an American astronomer who photographed it from Lick Observatory in California. No one is sure when the name "Horsehead nebula" was first used, NASA officials said.